Boccherini wrote very little vocal music; however he left two settings of the Stabat mater. It was first set in 1781 for solo soprano and strings and then in 1800 for two sopranos and tenor, obviously influenced by the hugely popular Pergolesi Stabat mater of 1736. There are many similarities in the notation and harmony—even the same key of F minor is used. The writing is of extraordinary individuality and seems to come straight from the heart. This unjustly neglected piece is surely one of the most remarkable sacred compostions of the era. Emanuele d'Astorga was one of the most colourful figures in early eighteenth-century music and his life has often been the subject of legend rather than fact (brief details of which can be discovered in Robert King's illuminating booklet notes). During his life, Astorga was best known for his well-written and tuneful chamber cantatas (of which more than 150 survive) and his opera Dafni (only Act 1 now survives). But by far his most enduring work has proved to be this setting of the Stabat mater, his only surviving sacred composition. Throughout it we hear Astorga's gift for writing warm melodies, typical of the Neapolitan style of the time, and how he captures the melancholy of this most desolate of sacred texts. Luigi Boccherini was born in Lucca, Italy, into a talented artistic family: his father played the cello and the double bass, his brother was a poet and dancer who wrote libretti for Salieri and Haydn, and his sister was a distinguished ballet dancer. He made his public debut as a cellist at the age of only thirteen, and studied composition first with his father, afterwards with the Lucca maestro di cappella Francesco Vanucci, and finally with Costanzi in Rome. When he was fourteen, the first of a series of moves to highly influential European musical capitals began: he and his father were summoned to the imperial capital, Vienna. Here they continued to impress with their concert performances in the court theatre. For the next seven years Boccherini travelled between Vienna and his home town, composing and performing. He also took periods of leave to visit Milan where he is said, in 1765, to have arranged the first public string quartet performances. In 1766 he went on a European tour, ending up in Paris where he came under the patronage of the influential Baron Bagge: a succession of publications of Boccherini’s works followed, including six string quartets, a set of trios, music for violin and piano and further chamber music. Next stop, possibly at the suggestion of the Spanish ambassador, was Madrid, where he was much admired and eventually appointed to serve under the Infante as composer and performer. He married a Spanish wife, and during the next fifteen years composed many of his string quintets—a musical form decreed by the court establishment. He also made contacts with nobility from Prussia and Portugal, and met the English author and traveller William Beckford. For support he relied heavily on patronage and, in his latter years, on a pension negotiated with his Spanish employer. His location for part, at least, of those latter years is the subject of some mystery: some scholars have suggested that he remained in Spain, whilst others have assumed that he worked in Germany. What is clear is that, in the late 1790s, and now certainly back in Spain, and despite the popularity of his music (especially in Paris and, to a lesser extent, in London), Boccherini fell into poverty: distressed by the deaths of his two daughters and his second wife in 1804, he died the following year. Boccherini’s compositional output is substantial and, dictated by the circumstances of his life, largely instrumental. Over one hundred and twenty string quintets survive, as do one hundred quartets and nearly fifty trios, more than two dozen symphonies and eleven cello concertos. His vocal music is sparse, comprising just one Mass setting (now lost), two oratorios, a handful of single Mass movements, a few motets, one opera and three cantatas. So his setting, in 1781, for solo soprano and strings of the Stabat mater text might seem somewhat surprising. For its genesis, and for its subsequent revision in 1800 for two sopranos and a tenor, we must look back to the unique popularity enjoyed by Pergolesi’s 1736 setting of the same text, which became the most published and most imitated single work of the century. It appeared in many adaptations: even Bach copied it for Tilge, Höchster, meine Sünden. The circumstances of Pergolesi’s death, dying tragically during his mid-twenties after becoming the most sought-after composer of opera of his generation, helped him and his (alleged) last work achieve legendary status. The influence of Pergolesi on Boccherini’s setting of the Stabat mater, the sequence for the Feast of Seven Dolours of the Blessed Virgin Mary, is abundantly clear. Like Pergolesi, Boccherini chooses the melancholy key of F minor and a bittersweet mood of tender supplication, juxtaposed with vocal writing that would more normally be associated with opera. The same sighing appoggiaturas and advanced harmony that made Pergolesi’s work so forward-looking for its time are still present: even the famous Pergolesi walking bass is heard at the opening of the final section. Throughout Boccherini’s remarkable succession of solos, duets and trios there is a constant flow of invention. Here is writing of extraordinary individuality from a composer, nearing the end of his life, setting one of the most poignant of all sacred texts with an open Christian conviction that comes straight from the heart. The opening, large-scale movement mixes string writing of startling, anguished textures (also showing Boccherini’s fastidious eye for expressive detail) with ravishing vocal melancholy. The gentle ‘Cuius animam’, still gloriously bittersweet, is interrupted at its conclusion by the second soprano, setting up the melodic ‘Quae maerebat’. A winding violin melody introduces the accompagnato-like ‘Quis est homo’ and a tender ‘Pro peccatis suae gentis’, in which Jesus gives up his spirit with exquisite, gentle simplicity. The ‘Eia mater, fons amoris’ is particularly striking, the instrumental prelude coloured by Boccherini’s favoured cello playing in its rich treble tessitura, the sopranos eloquently and operatically duetting. The busy vocal trio ‘Tui nati vulnerati’ is introduced by active string figurations, scales flying, with contrast supplied by a slow, veiled middle section. ‘Virgo virginum praeclara’ is another masterpiece: the instrumental texture of solo violin, accompanied by pizzicato cello, viola countermelody and the second violin’s gently rocking figurations, creates a rich cushion of sound for a ravishing soprano melody. The second soprano’s ‘Fac ut portem’ is lyrical in its gentle rocking 6/8 rhythm, followed by the total contrast of the aggressive, triumphant trio ‘Fac me plagis’. For ‘Quando corpus’ such operatic devices are forgotten: Pergolesi’s bass returns in a mood of total submission—all passion has been spent. The bells of paradise gently chime in the violins, and the work closes with Boccherini’s serene picture of the world to come. This extraordinary, neglected masterpiece is surely one of the most remarkable sacred compositions of the era. One of the most colourful figures in early eighteenth-century music, the life of Astorga has often been the subject of legend, rather than fact. Like Boccherini, he lived and worked in both Spain and Italy. His family was of Spanish descent, but had acquired a Sicilian barony in the early seventeenth century, living first in Augusta and then, after an earthquake in 1693, in Palermo. While Emanuele was a teenager his father attempted to murder his mother and was banished from Palermo, forfeiting his noble title to his eldest son. Subsequently nobility and rights were restored, and the father was elected a senator of the city. Emanuele was, as his family status might suggest, well educated, studying music, for which he showed considerable talent, writing an opera at the age of eighteen. But his father’s hot temper also seems to have been inherited, and Emanuele left home after a quarrel early in his twenties, eventually settling in Rome. There he became associated with the circle of Spain’s papal ambassador, the Duke of Osseda, becoming friends with poets including the Neapolitan Sebastiano Biancardi, who soon became Astorga’s principal librettist. When the two visited Genoa, they were robbed by their servant, and to raise funds Astorga and Biancardi wrote and staged an opera, Dafni. In the audience at that performance in April 1709, and much impressed by the music he had heard, was Charles III, the Habsburg claimant to the Spanish throne. Within months Astorga was summoned to Charles’s court at Barcelona. When Charles became Emperor (or maybe just before), Astorga moved with the court to Vienna where he was granted a large pension. The Venetian composer Antonio Caldara was also working in Vienna at the time, and Astorga became godfather to one of his daughters. He also ran up some large debts, which may have contributed to his sudden departure from Austria in 1714. By siding with the Austrians during the War of the Spanish Succession, he forfeited the estates and title that he would have inherited from his father (his brother also having died), but his mother and sister reclaimed them and made them over to him. Marrying a fifteen-year-old girl in 1717, Emanuele lived for another four years in Sicily, had three daughters but then deserted them, moved to Lisbon and never again returned to his family or homeland. The remainder of his life is a mystery: there are unconfirmed reports (from the often embroidering pen of the English historian John Hawkins) that Astorga ‘passed a winter or two in London, from where he went to Bohemia’, but little else is known. His last manuscript is dated 1731, and by 1744 the family estates in Sicily had been sold by his wife and sister, now heavily in debt. In his day, Astorga was best known for his chamber cantatas, of which more than one hundred and fifty survive. These are well written, tuneful and were thoroughly popular. Only the first Act of the opera Dafni now survives. But by far his most enduring work has proved to be a setting of the Stabat mater, his only surviving sacred composition. Whether it was the apparent romance of his adventurous life that attracted people, or the allure of a wild nobleman who wrote good music, a veritable cult for Astorga grew up during the nineteenth century. Epics, dramas and novellas were written and, in the absence of much fact, legends were invented, colourfully describing the gruesome death of his father on the scaffold. Johann Joseph Abert wrote an opera in 1866 in which Astorga becomes deranged, only being brought back to sanity when his wife plays a few bars of his Stabat mater setting. The work appeared in many manuscript copies, was published several times and performed with considerable frequency. Hans Volkmann, Astorga’s great champion and biographer at the start of the twentieth century, dated the Stabat mater, purely (and rather debatably) on stylistic grounds, to around 1707. There are equally valid arguments for any date up to around 1730. Whatever, throughout we see Astorga’s gift for writing warm melodies, typical of the Neapolitan style of the time. He also captures the melancholy of this most desolate of sacred texts and, especially in the choruses, demonstrates a thorough grasp of counterpoint, but never at the expense of musicality. The work sets twenty of the standard three-line verses, connecting four for the third, double-duet movement, but otherwise using pairs for the independent movements. In his scoring Astorga takes a variety of combinations of chorus, solo, duet and trio. The mixture of melody with melancholy, sweetness tempered with mild chromaticism, old-fashioned polyphony contrasted with Neapolitan cantilena, a surprisingly Germanic use of motivic development in the bel canto bass solo ‘Fac me plagis vulnerari’ and the final, quietly operatic chorus which gently directs the listener away from the Virgin’s sorrow towards the Carmelite missal’s more optimistic ‘palm of victory’, all show an enormously attractive musical style. Composers and their work often enjoy a bumpy progression through history, but few paths can have been as bizarre as that of Astorga: in the eighteenth century a musical nobleman, during the nineteenth century a folk hero, and in the twentieth—oblivion. Luigi Boccherini naquit à Lucques (Italie) dans une talentueuse famille d’artistes: son père était violoncelliste et contrebassiste; son frère, poète et danseur, fut librettiste de Salieri et de Haydn, et sa sœur fut une émérite danseuse de ballet. Luigi n’avait que treize ans lorsqu’il fit ses débuts de violoncelliste en public; il étudia la composition auprès de son père, puis de Francesco Vannucci (maestro di cappella à Lucques) et, enfin, de Costanzi, à Rome. À quatorze ans, il entreprit une première série de voyages dans les plus influentes capitales musicales européennes: appelés à Vienne, capitale impériale, son père et lui ne cessèrent d’impressionner par leurs concerts, au théâtre de la cour. Dès lors, et durant sept ans, Boccherini se partagea entre Vienne et sa ville natale, composant et jouant. Il prit également des congés pour se rendre à Milan, où il aurait arrangé, en 1765, les premières exécutions en public de quatuors à cordes. En 1766, il partit pour une tournée européenne et se retrouva à Paris, où il tomba sous le patronage de l’influent baron Bagge. S’ensuivit une série de publications d’œuvres, parmi lesquelles six quatuors à cordes, un corpus de trios, des pièces pour violon et piano, ainsi que d’autres œuvres de chambre. Puis, probablement sur la suggestion de l’ambassadeur d’Espagne, il s’arrêta à Madrid, où il fut fort admiré, avant d’être finalement nommé compositeur et interprète au service de l’Infante. Il épousa une Espagnole et, au cours des quinze années qui suivirent, écrivit nombre de ses quintettes à cordes—une forme de musique décrétée par la cour. Il prit également contact avec les noblesses de Prusse et du Portugal, et rencontra l’auteur et voyageur anglais, William Beckford. Ses ressources reposèrent essentiellement sur le mécénat et, vers la fin de sa vie, sur une pension négociée avec son employeur espagnol. L’endroit où il passa au moins une partie de ses dernières années est sujet à quelque mystère: d’aucuns ont suggéré qu’il demeura en Espagne, d’autres ont présumé qu’il travailla en Allemagne. Une chose est sûre: à la fin des années 1790, Boccherini—alors certainement de retour en Espagne—sombra dans la misère, malgré la popularité de sa musique (surtout à Paris et, dans une moindre mesure, à Londres). Affligé par la mort de ses deux filles et de sa seconde femme (en 1804), il mourut en 1805. Les productions de Boccherini sont substantielles et, conséquence des impératifs mêmes de sa vie, essentiellement instrumentales. Plus de cent vingt quintettes à cordes survivent, ainsi que cent quatuors et presque cinquante trios, auxquels s’ajoutent plus de deux douzaines de symphonies et onze concertos pour violoncelle. Sa musique vocale, éparse, comprend une seule messe (désormais perdue), deux oratorios, quelques mouvements de messe isolés, quelques motets, un opéra et trois cantates. Aussi sa mise en musique, pour soprano solo et cordes, du Stabat mater (1781) peut-elle un peu surprendre. Sa genèse, et sa révision subséquente (en 1800, pour deux sopranos et ténor), découlent de la popularité unique du Stabat mater de Pergolèse (1736), qui devint l’œuvre la plus publiée et la plus imitée du XVIIIe siècle. Elle parut sous de nombreuses adaptations: même Bach la copia pour Tilge, Höchster, meine Sünden. Les circonstances de la mort de Pergolèse, décédé tragiquement à moins de trente ans, après avoir été le compositeur d’opéra le plus recherché de sa génération, l’aidèrent, lui et sa—prétendue—dernière œuvre, à accéder au statut de légende. L’influence de Pergolèse sur le Stabat mater—la séquence pour la fête des Sept douleurs de la Vierge Marie—de Boccherini est des plus manifestes. Comme Pergolèse, Boccherini choisit la mélancolique tonalité de fa mineur et une atmosphère aigre-douce de tendre supplique, juxtaposée à une écriture vocale opératique. S’y retrouvent les mêmes appoggiatures soupirantes, la même harmonie évoluée qui valurent à l’œuvre de Pergolèse son caractère précurseur: même la fameuse «walking bass» de Pergolèse se fait entendre au début de la section finale. La remarquable succession de solos, de duos et de trios est, chez Boccherini, traversée d’un constant flot inventif. Nous sommes en présence d’une écriture extraordinairement personnelle, œuvre d’un compositeur qui, approchant de sa fin, mit en musique l’un des textes sacrés les plus poignants, avec une conviction chrétienne évidente, tout droit jaillie du cœur. Le mouvement d’ouverture, à grande échelle, allie écriture pour cordes aux textures étincelantes et angoissées (reflets de l’œil méticuleux de Boccherini pour le détail expressif) et ravissante mélancolie vocale. Le paisible «Cuius animam», encore glorieusement aigre-doux, voit sa conclusion interrompue par le second soprano, entreprenant le mélodique «Quae maerebat». Une ondoyante mélodie violonistique introduit le «Quis est homo», de type accompagnato, puis un tendre «Pro peccatis suae gentis», où Jésus rend l’âme avec une simplicité exquise, douce. L’«Eia mater, fons amoris» est particulièrement saisissant: le prélude instrumental est coloré par le jeu violoncellistique favori de Boccherini, dans sa riche tessiture aiguë, cependant que les sopranos réalisent un éloquent et opératique duo. L’animé trio vocal «Tui nati vulnerati» est introduit par d’actives figurations aux cordes, où les gammes s’envolent, en contraste avec une section médiane lente, voilée. «Virgo virginum praeclara» est un autre chef-d’œuvre: la texture instrumentale du violon solo, accompagné de pizzicati violoncellistiques, ainsi que du contre-thème (alto) et des figurations doucement cullando du second violon, crée un foisonnant coussin sonore où asseoir une mélodie de soprano. Le «Fac, ut portem» du second soprano, lyrique dans son paisible rythme cullando à 6/8, est suivi de l’agressif et triomphant trio «Fac me plagis», en total contraste. Pareils procédés opératiques sont oubliés pour «Quando corpus»: la basse de Pergolèse revient dans une atmosphère de complète soumission—toute passion a été épuisée. Les cloches du paradis carillonnent quiètement aux violons et l’œuvre s’achève sur le serein tableau boccherinien du monde à venir. Négligé, cet extraordinaire chef-d’œuvre est assurément l’une des plus remarquables compositions sacrées de l’époque. La vie de Astorga—l’une des plus pittoresques figures de la musique du début du XVIIIe siècle—a souvent été davantage sujette aux légendes qu’aux faits. À l’instar de Boccherini, Astorga vécut et travailla tant en Espagne qu’en Italie. De descendance espagnole, sa famille, ayant acquis une baronnie sicilienne au début du XVIIe siècle, vécut d’abord à Augusta, puis, à la suite d’un tremblement de terre survenu en 1693, à Palerme. Alors qu’Emanuele était adolescent, son père tenta d’assassiner sa mère et fut banni de Palerme, cédant son titre nobiliaire à son fils aîné. Plus tard, il recouvra ce titre et ses droits et fut élu sénateur de Palerme. Conformément à son statut familial, Emanuele reçut une bonne éducation, y compris en musique, art pour lequel il montra un talent considérable, écrivant un opéra à l’âge de dix-huit ans. Mais il semble avoir également hérité du tempérament chaud de son père et, après une querelle survenue vers ses vingt ans, partit de chez lui pour finalement s’installer à Rome. Là, il s’associa au cercle de l’ambassadeur du pape en Espagne, le duc d’Osseda, et se lia d’amitié avec des poètes, dont le Napolitain Sebastiano Biancardi, qui devint bientôt son principal librettiste. En visite à Gênes, tous deux furent dépouillés par leur domestique et écrivirent un opéra, Dafni, pour se renflouer. Dans l’auditoire de cette exécution, en avril 1709, se trouvait Charles III, prétendant des Habsbourg au trône d’Espagne. Fort impressionné par ce qu’il avait entendu, il appela Astorga à sa cour, à Barcelone, quelques mois plus tard. Quand Charles devint empereur (ou peut-être juste avant), Astorga partit avec la cour pour Vienne, où il s’était vu accorder une importante pension. Le compositeur vénitien Antonio Caldara travaillait alors dans cette ville et Astorga devint le parrain de l’une de ses filles. Il accumula des dettes, ce qui contribua peut-être à son départ soudain d’Autriche, en 1714. En se rangeant aux côtés des Autrichiens lors de la guerre de la Succession d’Espagne, il renonça aux terres et au titre qu’il aurait dû hériter de son père (son frère étant, lui aussi, mort), mais sa mère et sa sœur les réclamèrent et les lui cédèrent. Épousant, en 1717, une jeune fille de quinze ans, Emanuele vécut encore quatre ans en Sicile, eut trois filles, mais les abandonna et partit à Lisbonne—il ne devait jamais revoir ni sa famille, ni sa patrie. Le reste de sa vie est un mystère: des rapports non confirmés (nés de la plume, souvent enjoliveuse, de l’historien anglais John Hawkins) affirment que Astorga «passa un hiver ou deux à Londres, d’où il partit pour la Bohême», mais nous n’en savons guère plus. Son dernier manuscrit est daté de 1731; en 1744, sa sœur et sa femme, alors lourdement obérées, vendirent les terres du domaine familial, en Sicile. En son temps, Astorga fut surtout connu pour ses cantates de chambre, dont plus de cent cinquante survivent. Joliment écrites, mélodieuses, elles furent immensément populaires. Seul le premier acte de son opéra Dafni nous est parvenu. 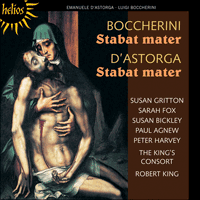 Mais son œuvre la plus durable est de loin une mise en musique du Stabat mater, son unique pièce sacrée survivante. Qu’il fût dû à l’apparent caractère romanesque de sa vie aventureuse ou au charme d’un noble excentrique qui écrivait de la bonne musique, un véritable culte de Astorga se développa au cours du XIXe siècle. Épopées, draines et novella [N d.T. : bref récit—romanesque ou non—ou conte] virent le jour et, en l’absence de faits nombreux, des légendes furent inventées, brossant avec pittoresque le macabre trépas de son père sur l’échafaud. En 1866, Johann Joseph Abert écrivit un opéra où Astorga, devenu fou, n’est ramené à la raison que lorsque sa femme joue quelques mesures de son Stabat mater. L’œuvre, parue dans maintes copies manuscrites, fut publiée plusieurs fois et interprétée extrêmement souvent. Hans Volkmann, grand apôtre et biographe de Astorga au début du XXe siècle, data le Stabat mater des environs de 1707, mais en se fondant sur des bases purement stylistiques (ce qui est quelque peu sujet à débat). En fait, des arguments tout aussi valables permettent d’étayer n’importe quelle date jusqu’en 1730. Qu’importe. Cette œuvre laisse voir le don de Astorga pour l’écriture de mélodies chaleureuses, typiques du style napolitain de l’époque. Le compositeur appréhende également la mélancolie du texte—le plus désolé de tous les textes sacrés—et, surtout dans les chœurs, fait montre d’une profonde compréhension du contrepoint, mais jamais aux dépens de la musicalité. L’œuvre met en musique dix des habituelles strophes de six vers, qui forment des mouvements indépendants, à l’exception du troisième mouvement, un double duo pour lequel deux strophes sont appariées. L’écriture de Astorga embrasse diverses combinaisons de chœurs, de solos, de duos et de trios. Le mélange de la mélodie à la mélancolie, la douceur tempérée par un léger chromatisme, la polyphonie surannée mise en contraste avec la cantilène napolitaine, un usage étonnamment germanique du développement motivique dans le solo de basse (un bel canto) «Fac me plagis vulnerari» et le chœur final, paisiblement opératique, qui éloigne calmement l’auditeur de l’affliction de la Vierge pour l’emmener vers «la palme de la victoire», plus optimiste, du missel carmélitain sont autant d’éléments révélateurs d’un style musical des plus séduisants. Les compositeurs et leurs œuvres jouissent souvent d’une progression cahotique dans l’histoire, mais peu de parcours ont été aussi bizarres que celui de Astorga: noble musicien au XVIIIe siècle, héros populaire au XIXe et … musicien oublié au XXe. Luigi Boccherini wurde im italienischen Lucca in eine Familie talentierter Künstler hineingeboren: Sein Vater spielte Cello und Kontrabaß, sein Bruder, der Libretti für Salieri und Haydn schrieb, war Dichter und Tänzer, seine Schwester eine namhafte Ballettänzerin. Er gab sein öffentliches Debüt als Cellist im Alter von nur dreizehn Jahren und nahm Kompositionsunterricht erst bei seinem Vater, dann bei Francesco Vanucci, dem maestro di capella von Lucca, und schließlich in Rom bei Costanzi. Als er vierzehn war, erfolgte der erste einer Reihe von Umzügen in europäische Musikzentren von Rang: Er und sein Vater wurden in die kaiserliche Hauptstadt Wien berufen. Dort hatten sie fortgesetzten Erfolg mit ihren Konzerten bei Hof. In den nächsten sieben Jahren reiste Boccherini als Komponist und ausführender Musiker zwischen Wien und seiner Heimatstadt hin und her. Zwischendurch nahm er sich frei, um Mailand zu besuchen, wo er 1765 die ersten öffentlichen Darbietungen eines Streichquartetts organisiert haben soll. Im Jahre 1766 ging er auf Europatournee und fand sich schließlich in Paris wieder, wo er vom einflußreichen Baron Charles Ernest de Bagge protegiert wurde. Nacheinander kamen nun Werke von Boccherini heraus, darunter sechs Streichquartette, eine Serie von Trios, Musik für Geige und Klavier sowie weitere Kammermusik. Sein nächster Aufenthalt war Madrid (möglicherweise auf Empfehlung des spanischen Gesandten in Paris), wo er höchste Bewunderung erntete und nach einiger Zeit zum Komponisten und Kammervirtuosen des Infanten ernannt wurde. Er heiratete eine Spanierin und schrieb im Laufe der nächsten fünfzehn Jahre viele seiner Streichquintette—die musikalische Gattung wurde vom Hof vorgegeben. Außerdem nahm er Kontakt zu preußischen und portugiesischen Adelsfamilien auf und lernte den englischen Autor und Reisenden William Beckford kennen. Sein Lebensunterhalt hing weitgehend von Mäzenen und gegen Ende seines Lebens von einer Rente ab, die sein spanischer Dienstherr aussetzte. Sein Wohnort, zumindest für einen Teil jener späteren Jahre, gibt den Fachleuten Rätsel auf: Einige haben die Meinung verteten, er sei in Spanien verblieben, während andere zu der Annahme gelangten, er sei in Deutschland tätig gewesen. Unbestritten ist, daß Boccherini Ende der 1790er Jahre, als er mit Sicherheit wieder in Spanien weilte, trotz der Beliebtheit seiner Musik (insbesondere in Paris und in geringerem Maße auch in London) in Armut verfiel. Erschüttert vom Tod seiner beiden Töchter und seiner zweiten Frau im Jahre 1804 starb er im folgenden Jahr. Boccherinis kompositorisches Schaffen ist recht umfangreich und konzentriert sich, bestimmt von seinen Lebensumständen, im wesentlichen auf Instrumentalmusik. Es sind über einhundertzwanzig Streichquintette, hundert Quartette und fast fünfzig Trios erhalten, dazu mehr als zwei Dutzend Sinfonien und elf Cellokonzerte. Der Umfang seiner Vokalmusik ist gering und beläuft sich auf nicht mehr als eine (heute verschollene) Messevertonung, zwei Oratorien, eine Handvoll einzelner Messeteile, einige wenige Motetten, eine Oper und drei Kantaten. Darum mag es überraschen, daß er 1781 den Text des Stabat mater für Solosopran und Streicher vertont hat. Um dessen Entstehung und die anschließende Bearbeitung für zwei Soprane und einen Tenor im Jahre 1800 zu erklären, müssen wir uns die einzigartige Beliebtheit vor Augen führen, die Pergolesis 1736 erschienene Vertonung des gleichen Textes genoß—sie wurde zum meistveröffentlichten, meistimitierten Werk des Jahrhunderts. Sie erschien in zahlreichen Bearbeitungen: Selbst Bach kopierte sie in Tilge, Höchster, meine Sünden. Die Umstände von Pergolesis Tod, der tragischerweise mit sechsundzwanzig Jahren starb, nachdem er zum gefragtesten Opernkomponisten seiner Generation aufgestiegen war, verhalfen ihm und seinem—angeblich—letzten Werk zu einem legendären Ruf. Der Einfluß Pergolesis auf Boccherinis Vertonung des Stabat mater, der Sequenz zum Fest der Sieben Schmerzen Mariens, ist klar erkennbar. Wie Pergolesi wählt Boccherini die melancholische Tonart f-Moll sowie eine bittersüße Stimmung zärtlichen Flehens und setzt dagegen einen Vokalsatz, wie man ihn eher mit der Opernbühne verbinden würde. Die seufzenden Vorschläge und anspruchsvollen Harmonien, die Pergolesis Werk zu seiner Zeit so vorausschauend wirken ließen, sind auch hier vorhanden; selbst Pergolesis berühmter Laufbaß ist in der Eröffnung des Finalabschnitts zu hören. Boccherinis bemerkenswerte Abfolge aus Soli, Duetten und Trios besticht durch fortwährenden Ideenreichtum. Das Werk zeugt von der außerordentlichen Individualität eines Komponisten, der in seinen letzten Lebensjahren einen der ergreifendsten aller geistlichen Texte mit unverhohlener, direkt von Herzen kommender christlicher Überzeugung vertont hat. Der großangelegte erste Satz vereint eine von erstaunlichen, qualvollen Strukturen geprägte Streicherführung (die auch Boccherinis gutes Auge für expressive Details belegt) mit hinreißender Melancholie der Gesangsstimmen. Das sanfte, immer noch wunderbar bittersüße „Cuius animam“ wird gegen Ende vom zweiten Sopran unterbrochen, der das melodische „Quae maerebat“ vorbereitet. Eine gewundene Geigenmelodie führt das an ein Accompagnato gemahnende „Quis est homo“ und ein zärtliches „Pro peccatis suae gentis“ ein, in dem Jesus mit erlesener, sanfter Schlichtheit sein Leben aushaucht. Das „Eia mater, fons amoris“ ist besonders eindrucksvoll—die von Boccherini bevorzugte, üppig klingende hohe Tessitura des Cellos bestimmt das instrumentale Vorspiel, und die Soprane duettieren beredt und opernhaft. Das lebhafte Gesangstrio „Tui nati vulnerati“ wird von geschäftigen Streicherfigurationen voll behender Läufe eingeleitet; für Kontrast sorgt ein langsamer, verschleierter Mittelabschnitt. „Virgo virginum praeclara“ ist ein weiteres Meisterstück: Die instrumentale Struktur, bestehend aus der Sologeige, die von pizzicato gespielten Celli begleitet wird, einer Gegenmelodie der Bratschen und sanft wiegenden Figuren der zweiten Geigen, bildet ein üppiges Klangpolster für eine hinreißende Sopranmelodie. Das „Fac ut portem“ des zweiten Soprans mit seinem behutsam wogenden 6/8-Rhythmus wirkt lyrisch, in völligem Gegensatz zum folgenden, von Aggression und Triumph gekennzeichneten „Fac, me plagis“. Bei „Quando corpus“ sind derartige opernhafte Kunstgriffe vergessen: Pergolesis Baß kehrt im Gemütszustand vollkommener Unterwerfung wieder—alle Leidenschaft hat sich erschöpft. Die Glocken des Paradieses klingen sanft in den Geigen an, und das Werk schließt mit Boccherinis heiter gelassener Vorstellung von der künftigen Welt. Dieses außerordentliche vernachlässigte Meisterwerk ist sicherlich eine der bemerkenswertesten geistlichen Kompositionen seiner Epoche. Das Leben Emanuele d’Astorgas, einer der farbigsten Gestalten der Musik des frühen 18. Jahrhunderts, ist oft eher als Legende denn als Tatsachenschilderung behandelt worden. Wie Boccherini lebte und wirkte er sowohl in Spanien als auch in Italien. Seine Familie war spanischer Herkunft, hatte jedoch zu Beginn des 17. Jahrhunderts eine sizilianische Baronie erworben und sich erst in Augusta, dann nach einem Erdbeben im Jahre 1693 in Palermo niedergelassen. Als Emanuele noch im Jugendalter war, unternahm sein Vater einen Mordversuch an seiner Mutter; er wurde aus Palermo verbannt und mußte den Adelstitel an seinen ältesten Sohn abtreten. Später wurden dem Vater Titel und Privilegien zurückerstattet, und man wählte ihn zum Senator der Stadt. Emanuele genoß dem Rang seiner Familie gemäß eine gute Erziehung und wurde auch in Musik unterwiesen, für die er große Begabung zeigte—im Alter von achtzehn Jahren schrieb er eine Oper. Andererseits scheint er auch das jähzornige Temperament seines Vaters geerbt zu haben und verließ mit Anfang zwanzig nach einem Streit sein Elternhaus, um sich in Rom niederzulassen. Dort fand Emanuele Eingang in den Zirkel des Herzogs von Osseda, des spanischen Gesandten am päpstlichen Hof; er freundete sich mit Dichtern wie dem Neapolitaner Sebastiano Biancardi an, der bald Astorgas bevorzugter Librettist wurde. Bei einem Besuch der beiden in Genua wurden sie von ihrem Diener ausgeraubt, und um ihre Kasse aufzubessern, schrieben Astorga und Biancardi die Oper Dafni. Im Publikum der Aufführung im April 1709 befand sich auch Karl III, der Habsburger Anwärter auf den spanischen Thron, und der war von der Musik, die er gehört hatte, tief beeindruckt. Wenige Monate später wurde Astorga an Karls Hof in Barcelona berufen. Als Karl zum römisch-deutschen Kaiser erhoben worden war (oder möglicherweise kurz davor), zog Astorga mit dem Hof nach Wien, wo ihm eine üppige Rente zuerkannt wurde. Der venezianische Komponist Antonio Caldara war zu jener Zeit ebenfalls in Wien tätig, und Astorga übernahm die Patenschaft für eine seiner Töchter. Er machte erhebliche Schulden, was dazu beigetragen haben mag, daß er Österreich 1714 unvermittelt verließ. Dadurch, daß er sich im Spanischen Erbfolgekrieg auf die Seite Österreichs schlug, ging er der Besitzungen und des Titels verlustig, die er von seinem Vater geerbt hätte (nachdem auch sein Bruder verstorben war), doch seine Mutter und Schwester machten ihren Anspruch darauf geltend und übereigneten sie ihm. 1717 heiratete er eine Fünfzehnjährige, lebte mit ihr vier Jahre lang in Sizilien und zeugte drei Töchter, doch dann verließ er sie, siedelte nach Lissabon um und kehrte nie wieder zu seiner Familie oder in seine Heimat zurück. Der Rest seines Lebens bleibt ein Geheimnis: Es existieren unbestätigte Berichte (aus der oft zur Ausschmückung neigenden Feder des englischen Historikers John Hawkins), Astorga habe „einen Winter oder zwei in London verbracht, von wo er nach Böhmen ging“, aber sonst ist kaum etwas bekannt. Sein letztes Manuskript ist auf 1731 datiert, und bis 1744 hatten seine Frau und seine Schwester, die inzwischen hoch verschuldet waren, den Familienbesitz in Sizilien veräußert. Zu Lebzeiten war Astorga vorwiegend für seine Kammerkantaten bekannt, von denen über einhundertfünzig erhalten sind. Sie sind kompetent gesetzt und melodienreich und waren ausgesprochen populär. Von der Oper Dafni ist nur der erste Akt überliefert. Als sein bei weitem dauerhaftestes Werk erwies sich jedoch die einzige erhaltene geistliche Komposition, eine Vertonung des Stabat mater. Ob es die scheinbare Romantik seines abenteuerlichen Lebens war, die so viele Leute anziehend fanden, oder der Reiz eines ungebärdigen Adligen, der gute Musik zu schreiben wußte, jedenfalls kam im 19. Jahrhundert ein wahrer Astorga-Kult auf. Es entstanden einschlägige Epen, Dramen und Novellen, und in Ermanglung von Fakten wurden Legenden ersonnen, die blumig den grausigen Tod seines Vaters auf dem Schaffott beschrieben. Johann Joseph Abert schrieb 1866 eine Oper, in der Astorga dem Wahnsinn verfällt und erst wieder zu Verstand kommt, als seine Frau ihm einige Takte aus seinem Stabat mater vorspielt. Das Werk war in zahlreichen handschriftlichen Kopien in Umlauf, wurde mehrmals gedruckt und recht häufig aufgeführt. Hans Volkmann, Astorgas begeisterter Fürsprecher und Biograph zu Beginn des 20. Jahrhunderts, datierte das Stabat mater mit auschließlich (und umstritten) stilistischer Begründung auf die Zeit um 1707. Ebenso stichhaltige Gründe ließen sich für jedes Datum bis etwa 1730 anführen. Auf jeden Fall erkennen wir darin durchweg Astorgas Begabung für das Schreiben warmherziger Melodien, wie sie für den neapolitanischen Stil jener Zeit typisch waren. Außerdem fängt er die Melancholie dieses trostlosesten aller geistlichen Texte ein und demonstriert insbesondere in den Chören seine eingehende Beherrschung des kontrapunktischen Satzes, nie jedoch auf Kosten der Musikalität. Das Werk vertont zehn der gewohnten sechszeiligen Verse und faßt zwei zum dritten Satz zusammen, einem Doppelduett; ansonsten bildet jeder Vers einen eigenen Satz. Astorga setzt die verschiedensten Kombinationen von Chor, Solo, Duett und Trio ein. Ein Gemisch aus Melodik und Melancholie, Lieblichkeit, die durch milde Chromatik ausgeglichen wird, altmodische Polyphonie und im Kontrast dazu neapolitanischer Kantilenenstil, die überrraschend deutsch anmutende motivische Arbeit im Belcanto-Baßsolo „Fac me plagis vulnerari“ und der abschließende, unaufdringlich opernhafte Chor, der den Hörer sanft von der Trauer der Jungfrau ablenkt und zur optimistischeren „Siegespalme“ des karmelitischen Meßbuchs hinführt—das alles sind Belege für einen ungeheuer attraktiven Musikstil. Komponisten und ihr Schaffen sind oft den Unwägbarkeiten der Geschichte ausgesetzt, doch können nur wenige Entwicklungen so bizarr verlaufen sein wieder die von Astorga: im 18. Jahrhundert ein musikalischer Edelmann, das 19. Jahrhundert hindurch ein Volksheld, und im 20. Jahrhundert—Vergessenheit.